What do you think they will do? what do you hope they do? Dream would be it to just work like alpha 0.6 concerning the netcode. Re: Another update in the works! yes, i discovered the other smileys! 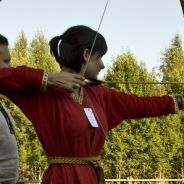 PS: We don't have an archery smiley, I officialy request one. i think they decided theres still too many players playing so they are going to break it some more. I still hope they'll finnally to make wotv a PLAYABLE game seriously... It as empty as nosgoth :p.
I think most of the blood fights made the gameplay worst, because actually, when the alpha was out, the game was better than it is now. It was fast, dynamic, almost as fast as Wotr. Now it is turns into some kind of glitch and slow boring fight. Anyway, I'm playing heroes of the storm, that's why i'm not really into wotr, or wotv. but if by any chance ig form a team for the beta of heroes of the storm which is out the 13th of January i would be up to play with you ! . Untill then, see yah at M&B Bannelord !